Good Nutrition Month and Sweet Potato Spelt Pastry | What Smells So Good? Now that October is over and done with, the real craziness of the holiday season has arrived! Between football season, (American) Thanksgiving, the (American) election, and the end of Daylight Savings Time, it's easy to forget the basics of eating properly in favour of "quick and convenient" prepackaged or drive through fare. But November is also Good Nutrition Month - and this year sweet potatoes are the theme ingredient! What does “good nutrition” mean? It means eating your 7-10 servings of fruit and vegetables each day. It means choosing whole grains and lean protein over refined, processed, or fatty varieties. It also means eating a balanced diet of protein, carbohydrates and fat and avoiding diets that eschew one or the other. It means drinking enough water and eating enough fibre every day. It means consciously choosing to eat whole foods your grandma would recognize, and cook them at home 90% of the time. And it means giving yourself permission to indulge in treats that are truly "worthy" to you that other 10%. Sweet potatoes are powerhouses of nutrition - with 438.1% the RDI of vitamin A and 3.76 g of fibre (keep in mind you should be getting at least 35 grams daily), the story is just beginning. For example, sweet potatoes have also been shown to have more absorbable beta-carotene than green leafy vegetables! Sweet potatoes, though sweet tasting and a naturally starchy vegetable, actually help keep blood sugar stable, even in cases of Type II diabetes! All the colour-containing pigments, as well as the natural proteins in the tuber, are packed with anti-inflammatories and antioxidants too. There are around 400 varieties of sweet potato grown and eaten around the world! The skin and flesh can be creamy pale, yellow, orange, pink, or even a deep purple! They are all tubers and (like potatoes, winter squash and corn) should be treated as your "starch side" when you're planning a menu, even though they are vegetables. For this Good Nutrition Month, I wanted to share a recipe that is a simple and versatile variation on a previous recipe:my favourite Potato Pastry Crust. 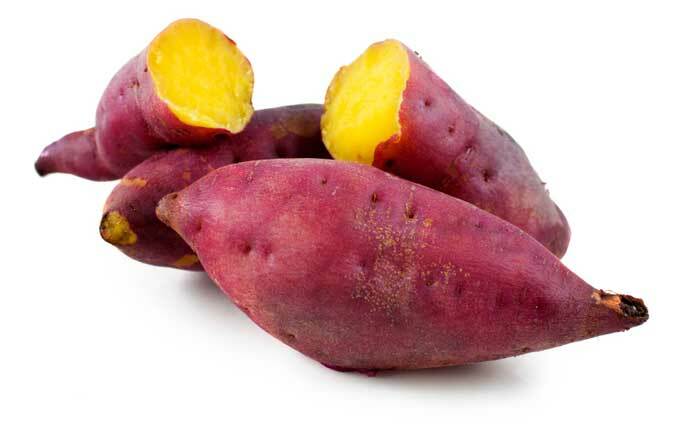 Instead of the Yukon Golds, I tried a few different varieties of sweet potatoes that I found both at my regular grocery store and the Asian market I frequent. The good old common "Garnet Yam" fared the best in terms of a smooth mash and a less-gloopy dough, not to mention the result was a stunning orange (FYI, this will brown in the fridge with prolonged storage). The purple type I tried was too wet to really "hold" the flour together, and I tried a white "Chinese Yam" too, which didn't mash so much as turn stringy (the taste wasn't to my liking on the latter one either, but I loved the purple potato's flavour!). For a different twist on my standard whole wheat pastry flour, I opted for spelt - which so happens to have more nutrients than standard wheat! I couldn't wait to share the pastry with you all, since it's delicious with the apple filling I made (and will share tomorrow!) but also as a savoury base for pot pies like chicken. Spread sweet potatoes in a single layer and roast until starting to brown, about 25-30 minutes, stirring every 10 minutes. Cool completely, then mash. Mix in the coconut oil and salt. Divide in half, wrap each half in cling wrap and refrigerate 1 hour before use.